One of the things I like about shooting along the beaches on the east end of Long Island is the subtlety of the scenery found in this part of New York State. While the beaches in the Hamptons are world famous for their jet setting crowd and millionaires, they are not photographed often as part of the natural landscape. I have some suspicions as to why this may be. First of all, although the beaches in the Hampton’s are public, access is made difficult due to parking restrictions and expensive day use fee’s. Furthermore, the beaches are void of stunning visual cue’s that the beaches found along the west coast of the United States have become famous for. There are no boulders, and sea stacks and large cliffs to use as props and areas of interest within the photograph. The beaches found on the east end of Long Island are known for their soft sand, subtle dunes and spaciousness. This makes strolls along the beach pleasant, but can make it difficult to capture the essence of the location in the image. When scouting locations and making images, I use this very essence to find and make images that speak to my feelings and impressions of how I view the beach and this location. Every time I arrive at one of these beaches, I find the scene completely different than the following day, month or year. The beach is a landscape in constant flux. The wind, rain, nor’easters, and tides shape the beach daily. I often return to locations I have photographed the prior year only to find the dunes have moved, or have been removed by a powerful storm. The night before I photographed this scene, heavy thunderstorms rolled over the beaches through the night. Heavy wind and rain fell late into the night. When I arrived at Halsey Neck beach, the skies were clear but the air was heavy with humidity from the night before. 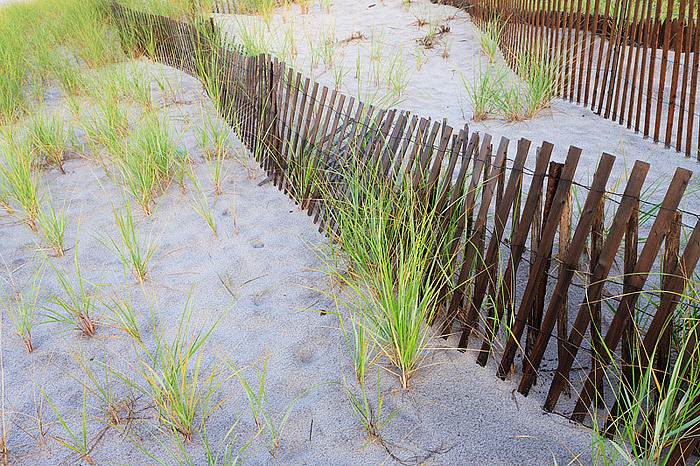 I was immediately drawn to the fences used to protect and reinforce the barrier dune formations. The dune grass was moist and a vibrant green from the moisture the night before. The sand was smooth and flat, matted down from the heavy rain as well. The dune fences, which usually are a bleached grey from the Sun and wind, were dark, coated with water and sea spray which helped to reinforce the texture of the wood used to makeup these fences. The wind, which is usually blowing along the beach was calm. I quickly hurried to capture the scene before the Sunrise would cast harsh shadows on the scene and remove the subtle texture I was looking to capture. Posted in Beaches and Oceans, New York, The Hamptons on August 3, 2011 by Tom Mangan. ← Previous: "Sunrise at Dune Beach"